Microsoft Studios seems to be serious about filming quality entertainment for the video-game crowd. 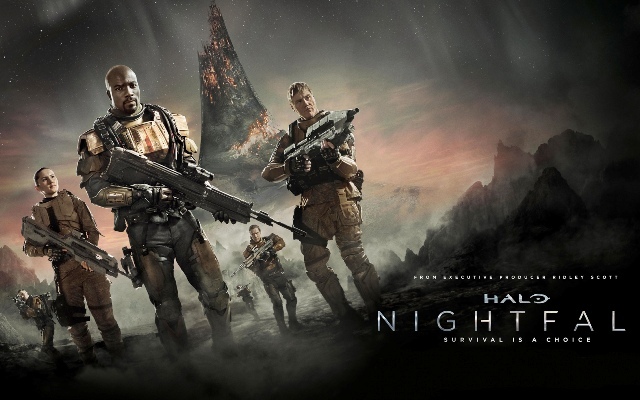 Halo: Nightfall is a stand-alone origin story for Jameson Locke (expertly portrayed by Mike Colter), who will be soon featured in the upcoming video game, Halo 5: Guardians. That means this movie is actually used as a promotional tool for the upcoming game. In times past, those roles would have been reversed. Originally released as five episodes and included with with Halo: The Master Chief Collection for the Xbox One, each episode has been seamlessly combined to create Halo: Nightfall as a feature film, clocking in at one hour and 38 minutes. On the planet Sedra, “This is supposed to be a time of peace.” Covert ONI soldiers discover Covenant troops that are up to no good. When an Elite Zealot ignites an unknown biological agent, many humans are killed. Apparently, the bomb was was created with a previously unknown element that is fatal for humans and harvested from a portion of the Alpha Shard, previously destroyed in the very first game of the series, Halo Combat Evolved. Locke is a manhunter and he’s the best of the best within the Office of Naval Intelligence. In a race against the clock, Lock and his ONI forces team up with local Sedran soldiers in an attempt to destroy the deadly mineral deposits before the sun rises, frying them all. Oh yeah, there are also hunter worms (aka Lekgolo) that should be avoided at all costs. Moving with a hive-like mind — but seems a lot like The Flood — these CGI creatures have a never-ending hunger, with their sights set on the soldiers. There’s lots of tension involved. In addition to a mutiny within the ranks and a sacrifice, there are nine people who must vie for two seats in the escape vehicle, in order to survive. No one is safe and no one is trusted. Halo: Nightfall is special-effects heavy, with the exotic landscapes of Belfast and Iceland playing an important role, essentially becoming a primary character throughout the story. The futuristic armor the soldiers wear is shiny and somewhat believable, while the Covenant troops and vehicles were clearly CGI and don’t remotely look realistic. Many of the soldiers seem to blend together, with the exceptions of Locke, Aiken (a former Spartan) and Macer (the only female of the cast). Christina Chong’s Macer is incredibly likable as the underdog Sedran soldier and Colter’s Wolfe commands the attention and respect of everyone onscreen, as well as the audience. The movie feels like Halo‘s Extended Universe instead of Halo canon: How is it remotely possible for a Spartan to quit being a soldier? That doesn’t remotely begin to make sense and Nightfall skirts the issue by never fully explaining it. Also, this Spartan is older and smaller than every other regular-sized soldiers. That feels like a very big error, since Spartans are supersoldiers, but maybe that’s just a casting director’s mistake. Included on the disc are lots of great extras, featuring behind-the-scenes stunts, actors and storylines… but the best ones are entitled Second Stories. These are the personal recordings of background characters that make the story feel realistic. Halo: Nightfall is a science-fiction character study, building onto the mythology of the Halo novels and comics that feels like a video game trapped inside a horror movie. This is the second live-action series set within the Halo Universe. Slowly but surely, Microsoft Studios is taking baby steps toward finally filming that long-rumored big-budget feature film, based on the video-game series. Strength: Interesting storyline with a few great characters. Weakness: Forgettable characters with a few plot holes in the storyline . WTF Moment: All the soldiers remove their armor and oxygen tanks before facing an unknown enemy. Makes lots of sense.